Alphabet Fitness joins Massachusetts health and wellness thought leaders. Karen Voght, developer of Alphabet Fitness for Kids, is excited to be joining John Ratey, Mary Catherine Bateson, and other health and wellness thought leaders at Cambridge, Massachusetts’ Women Explore Spring Forums. Her The Body in Motion workshop innovatively navigates the vital role our body’s motor movements play in permiting us to mold and remold human health, empathy, language, love, laughter, creative expression, and physical and cognitive memory …starting in utero and extending throughout the life span. 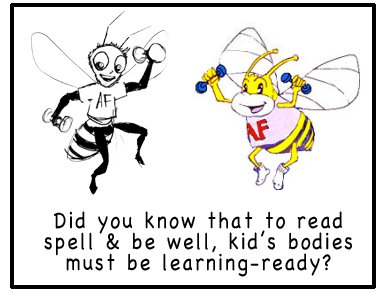 Playfully Exercising the ABCs ‘Positions’ Kids Bodies to Read, Write, Spell, and bee well! We at Wellness, Inc. wanted to share this recent article by Boston’s Children’s Museum on the importance of childhood play for healthy language development of young children. Right from the beginning, play fosters language development. When we play Peekaboo, or imitate a baby’s sounds and smiles, or ask a silly question and wait for the baby’s response, we teach the basics of communication and conversation. And the more we talk, especially in engaging, playful ways that encourage responses, the more language babies learn! Soon, they will not only be understanding and babbling, but saying words! For toddlers who are beginning to talk, play creates opportunities to learn new words. Silly songs and movement games teach words and concepts such as body parts and opposites. Active play can involve naming places and actions. Simple pretend play, like feeding a baby doll or playing with a doctor kit or toy farm, lets children repeat what a parent, doctor, or farmer might say. The mastery of the basics of language, which usually occurs between the ages of two and three and a half, heralds a flowering of creativity. Children build and play in imaginary worlds. They use language to pretend, be silly, ask questions, and figure things out. Their wordplay, songs, and storytelling build foundations for reading. As preschoolers and kindergartners, children whose language is strong are likely to be popular playmates. They tell stories that are fun to play out, and can keep conversation going. They ask interesting questions, and they can use their words to solve problems, explain their ideas, and compromise. As they play together, children build on each other’s ideas and learn new words from each other. At every age, adults can enhance the language-building power of play. Without taking over the child’s play or turning it into a lesson, adults can build on children’s ideas. They can supply words for what children are doing and ask questions that provoke thinking. They can extend a back-and-forth conversation, playing with sounds, words, or ideas. They can take on a role and play it with humor and gusto. They can add “juicy words” – specific, interesting words like “excavator,” ”camouflage,” or “scrumptious” – that are fun to say and make play more fun. In line with this article, we are happy to contribute programs such as Alphabet Fitness’s body-facilitated ABCs for linguistic well-being into early childhood education. Feel free to share your experiences with Boston Children’s Museum. Is today’s Barbie doll increasingly molding minds & bodies by remote, unknown knowledge sources? This link was forwarded to us by CCFC, Campaign for Commercial Free Childhood. CCFC works for the rights of children to grow up—and the freedom for parents to raise them—without being undermined by commercial interests. They advocate for policies to protect children from harmful marketing, and promote commercial-free time and space for kids. Our campaign to stop Mattel’s “Hello Barbie” is off to an incredible start. Already, our concerns have been featured on Good Morning America, The Washington Post, the front page of USA Today, CNN, Fox News, Mashable and hundreds of other publications around the world. The creepy doll that records and analyzes children’s conversations is the talk of social media. Imagine your children playing with a doll that records everything they say and transmits it all to a corporation which analyzes every word to learn “all of [your child’s] likes and dislikes.” That’s exactly what Mattel’s eavesdropping “Hello Barbie” does. Unless we take action, it will be in toy stores this autumn. Kids using “Hello Barbie”‘ aren’t only talking to a doll, they are talking directly to a toy conglomerate whose only interest in them is financial. It creates a host of dangers for children and families. The Wi-Fi-connected “Hello Barbie” uses an embedded microphone to record children’s voices—and other nearby conversations—before sending them over the Internet to cloud servers. From there, Mattel’s technology partner ToyTalk processes the audio with voice-recognition software. During its Toy Fair 2015 product demonstration, Mattel said it will use this information to “push data” back to children through Barbie’s built-in speaker. Any talking toy diminishes opportunities for truly creative play. But “Hello Barbie’s” eavesdropping capabilities take technology to an even more troubling level. Children naturally reveal a lot about themselves when they play. In Mattel’s demo, Barbie asks many questions that encourage kids to share information about their interests, their families, and more—all of which could be of great value to advertisers and be used to market unfairly to children. “Hello Barbie” ensures that Mattel—not the child—is driving the play and the relationship. It’s being marketed as a toy that will “deepen that relationship girls have with [Barbie].” The goal is to have the child and Barbie “become the best of friends.” But children need relationships with real friends—not corporate computer generated messages created after listening in on anyone within range of Mattel’s microphones. Thanks for caring about children and families! Alphabet Fitness Gets Kids OXYGENATING Brain & Body While Learning Their ABCs! We are thrilled that his very 1st Brain Rule confirms the need to move to oxygenize the brain…increasing neuron creation, survival, and resistance to damage and stress. The human brain evolved under conditions of almost constant motion. From this, one might predict that the optimal environment for processing information would include motion. That is exactly what one finds. Indeed, the best business meeting would have everyone walking at about 1.8 miles per hour. Researchers studied two elderly populations that had led different lifestyles, one sedentary and one active. Cognitive scores were profoundly influenced. Exercise positively affected executive function, spatial tasks, reaction times and quantitative skills. So researchers asked: If the sedentary populations become active, will their cognitive scores go up? Yes, it turns out, if the exercise is aerobic. In four months, executive functions vastly improve; longer, and memory scores improve as well. Exercise increases oxygen flow into the brain, which reduces brain-bound free radicals. One of the most interesting findings of the past few decades is that an increase in oxygen is always accompanied by an uptick in mental sharpness. Exercise acts directly on the molecular machinery of the brain itself. It increases neurons’ creation, survival, and resistance to damage and stress. 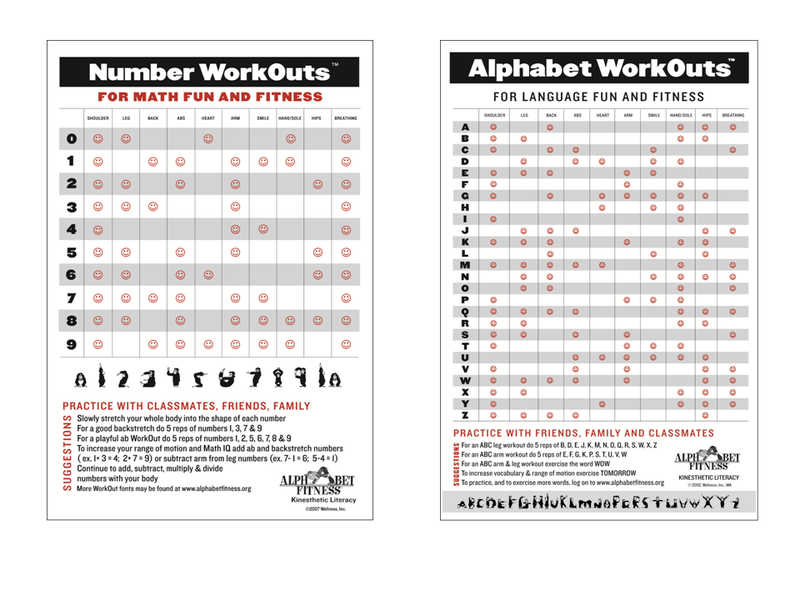 Alphabet Fitness Activities give kids a jump on the benefits of physical activity while in the classroom! Over the past thirty years, physical activity among children has declined markedly. The public health implications of this decline include a growing prevalence of obesity and chronic diseases such as diabetes and hypertension. A new issue of Monographs of the Society for Research in Child Development expands the focus to ask whether physical activity is also related to children’s brain and cognitive development and achievement in school. Scholarly articles published by over 20 researchers in Monographs, titled “The Relation of Childhood Physical Activity to Brain Health, Cognition and Scholastic Achievement” indicate that while physical activity in schools has diminished in part because of a growing emphasis on student performance and academic testing, decreased physical activity is actually related to decreased academic performance. Approximately 55.5 million children are enrolled in pre-kindergarten — 12th grade in the United States in a given academic year. According to research presented in Monographs, while there is variation across states and schools, overall, opportunities to engage in physical activity have diminished. Current U.S. Department of Health and Human Services guidelines call for children to have a minimum of 60 minutes of intermittent physical activity per day. However, in 2012, according to the Centers for Disease Control and Prevention, only 30 percent of children attended a school in which they were offered physical education daily. The majority of students do not engage in any form of planned physical activity during the school week. Yet physically active children tend to outperform their inactive peers in the classroom and on tests of achievement. The research presented in the monograph helps to make clear why. When compared to their less fit peers, those who engage in more physical activity have larger brain volumes in the basal ganglia and hippocampus, areas associated with cognitive control and memory. Cognitive control refers to the control of thought, action, behavior, and decision-making. Physically active children also have increased concentration and enhanced attention spans when compared to their less active peers. The authors find that fitness is related to the ability to inhibit attention to competing stimuli during a task, an ability that can help children stay focused and persevere to complete an assignment. The findings on attention encompass children with special needs as well as typically developing children. The authors also report on physical activity as a non-pharmaceutical intervention for children with attention-deficit/hyperactivity disorder and children with autism spectrum disorders, with positive results. Hillman also notes that the findings in the monograph come not only from studies looking at variation in physical activity and fitness level as they occur spontaneously among children, but also from studies in which children are randomly assigned to physical activity interventions or to continue their ongoing activity levels. This helps to assure that the links between physical activity, brain development and achievement are actually caused by the differences in activity rather than reflecting the characteristics of the children who choose to be more or less physically active. The above story is based on materials provided by Society for Research in Child Development. Note: Materials may be edited for content and length. 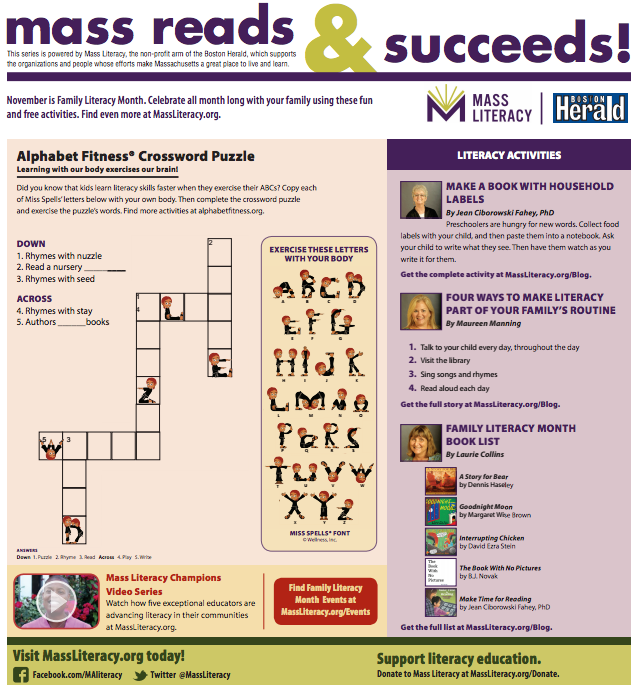 Our Alphabet Fitness CrossWord Puzzles hit the Boston News Papers!! Our founder, Karen Voght, has just begun the 1st Alphabet Fitness Cross Word Puzzles for children, their friends, and families. This is an exciting format for synchronizing language and fitness and we wanted to share it with you all.